Each semester, DIS students enroll in a Danish or Swedish Language and Culture course to learn how to navigate cultural contexts, and gain the tools to better understand the people, history, and traditions of Denmark and Sweden. DIS: What’s it like to be a full-year student? Has this influenced your experience and understanding of the culture here in Denmark? Atousa Motameni: I have had the opportunity to see the locals and Denmark through all the holidays and changes in the seasons. When I first arrived, it was a gorgeous summer, and Copenhageners were laughing in the streets and lying out on the grass in the many castles gardens around the city. As the months passed, it got darker every day, and everyone disappeared inside where they lit candles and drank Christmas beer. Det var meget hyggeligt! 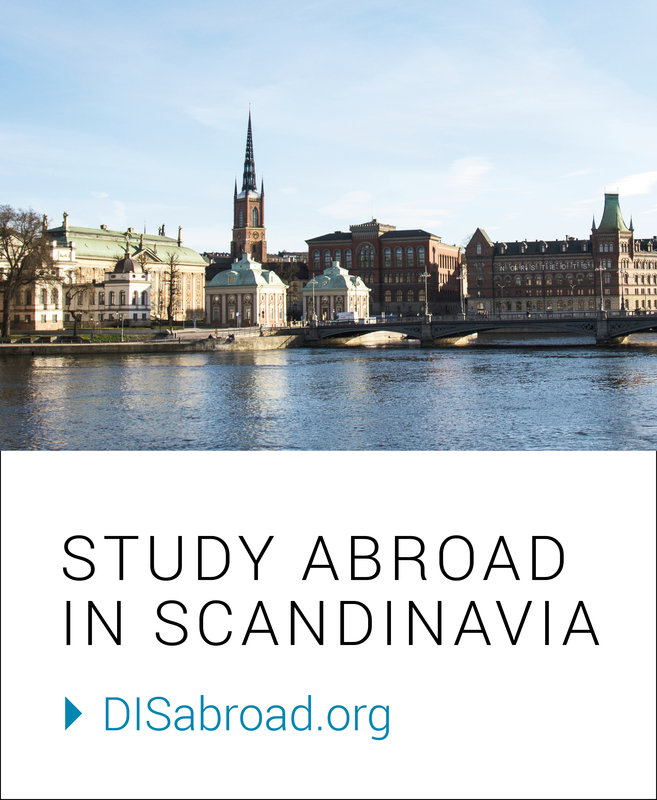 DIS: Which Danish Language and Culture field study has been your favorite? AM: I really enjoyed going to Rosenborg Castle because it brought the history we learned in class to life in the form of beautiful architecture and symbolism perfectly preserved from centuries ago. It was also wonderful to see the magnificent crown jewels, which are still used by the royal family today. DIS: Can you tell us about participating in Language Cafés? AM: Language Cafés happen every Wednesday and are available for drop-in help with Danish. I try to go to this every week since it gives me a chance to practice speaking with the Assistant Program Director, who is patient enough to listen to me stumble through new words. There are also Onsdagssnegle (pastries) from Sankt Peders Bakery and that is an added bonus! DIS: What are your favorite ways to practice your language skills outside of the classroom? 1. Ordering food in Danish! Some of my regular places have gotten used to me and will let me try out more complicated phrases with them, so it’s been really fun doing that. 2. At my Kollegium, I practice speaking Danish to the people on my floor. I am not quite able to have very long conversations yet, but it’s nice to practice in a more practical setting as much as I can. 3. I’ve started to only listen to Danish music. Spotify has some great playlists for Danish artists that I listen to when I’m walking to class in the mornings. 4. When I watch my usual shows on Netflix, I’ll turn on Danish subtitles, so that even when I’m watching something like Sherlock, I can see how phrases in English translate. DIS: Tell us a bit about your housing experience. AM: Last semester I lived in a Homestay in Høje Tåstrup, which gave me insight into family life here. I was located about forty minutes out of the city center by train and I really enjoyed the commute. This semester, I live in a Kollegium, which gives me perspective on local students closer to our age. My Kollegium is in Christianshavn, so I’ve taken advantage of biking a lot more than I normally would in the States. DIS: What has been your favorite part of living with local students? AM: There are three Danes on my floor out of eight people total. Most weeks, we have a family dinner. It’s a night I always look forward to, especially because of the hilarious conversations we have together! DIS: Your class visited a local gymnasium to exchange cultural perspectives with youth. What was one thing you learned? AM: The gymnasium is similar to high schools in the U.S., but more focused on what students plan to study in university. I really enjoyed the field study. Afterward, we were lucky to be invited to have dinner with some of the students at their homes! The more personal interaction with them outside the classroom was great because we asked them all sorts of questions about their culture and opinions on things like Janteloven. DIS: Name one person you’ve met that made an impression on you. AM: For Core Course Week, my class A Sense of Place in European Literature went to the island of Fanø off the Western Coast of Denmark for the short tour. There, we met with the Danish poet Jeppe Brixvold and experienced the island where his poem, ‘Øster Land,’ takes place. Since it was a literature class, we focused on the English version of the poem, but were given the original Danish copy as well. When we met with Jeppe, he spoke about the translation and how the references that made a lot of sense in Danish, when translated, were unfortunately lost. It was interesting for me to read the original Danish poem and see rhymes and rhythms that were not present in the English version, and to have enough knowledge of the language that I could appreciate the original. DIS: Tell us about your experience with the tradition of the green tablecloth exam. AM: The color green is supposed to calm you down, so when you enter an exam room and there is a green tablecloth, you are more relaxed while taking the exam. During our oral exams, our teacher sat each of us at a table with the green tablecloth. I remember being incredibly nervous for the oral exam, but while there, I felt much more relaxed than I expected to feel — maybe that could be attributed to my Danish teacher’s reassuring nods and possibly the green tablecloth. DIS: What tips would you give to a student taking the Danish Language and Culture course? Use your surroundings in Denmark to your advantage since they will help you learn the language and culture beyond the essentials you learn from the textbook and readings. Start integrating the language into your daily life by saying tak instead of ‘thank you’ and nej instead of ‘no’ or even just using phrases like god morgen or vi ses with your friends and professors while you’re here. If you live with locals or talk with a server in a restaurant, they appreciate almost any effort you make to learn the language since there are not many people in the world who want to learn Danish. Don’t be afraid to try to say something in Danish, even if you’re not understood at first. The more you try, the sooner you will get to a point where they do!